And lately I’m going a bit crazy. 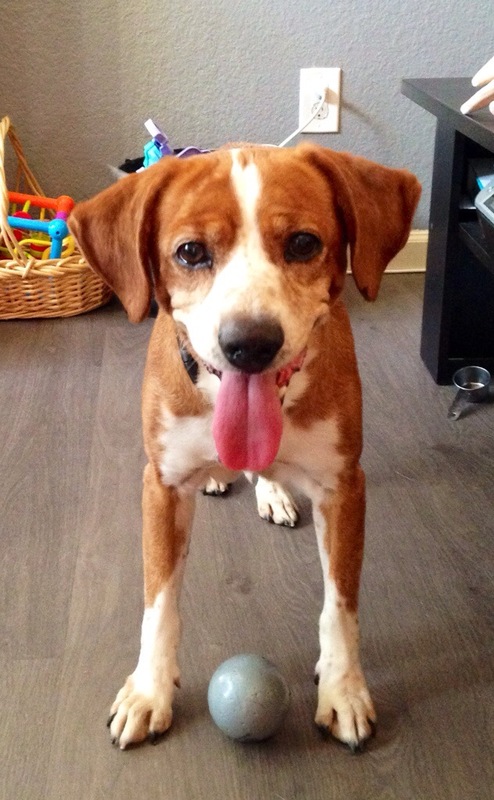 To make a very long story short, we adopted a 10 year old beagle mix sight unseen just before he was to be put down at the pound. Turns out he’s a puppy in old man clothing and is requiring a lot of medical attention. He’s a cutie, but it’s been a lot of work and stress. If you’re feeling extra generous today you can help donate to a portion of his care here. This has all been extra stressful because I haven’t been able to knit much if at all. 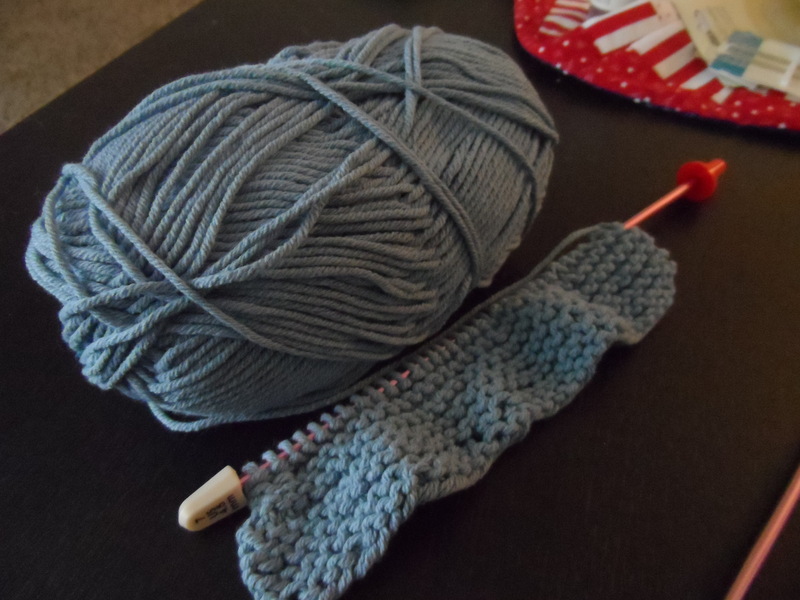 Knitting is usually how I diffuse stress in my life, and it’s so frustrating that my wrist hurts to much to do it. I’m in the process of trying a few home remedies for it, and so far so good, but it’s slow going. I did manage to add the second color to my Summer Scarf though. Since it’s been taking so long I feel like I keep missing opportunities to wear it, but I guess it’s more wearable than some of the woollies I have. What are you knitting that helps you de stress? Wow, sorry I’ve been kind of MIA lately. Turns out preparing for my first fiber event (not to mention entertaining a busy 1-year-old) is exhausting! I’m happy to report that for my first event, it was great! 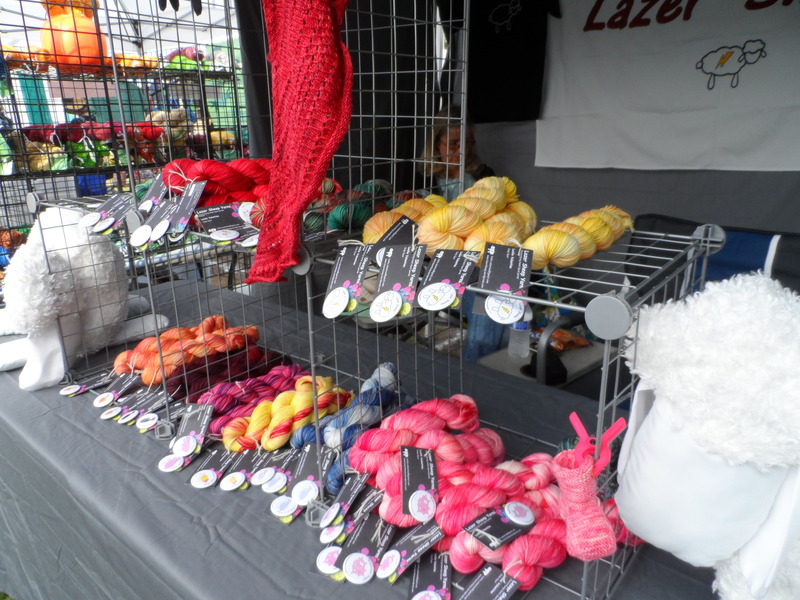 I met a lot of awesome people, and some of them even liked and bought my yarn! 😀 Big shout out to Candy Skien and Oink Pigments, who were not only lovely neighbors, but really awesome ladies with lots of tips for this newbie! I had another bout of camnesia, and only snagged a few pictures all weekend… regrettably all of my own booth haha. 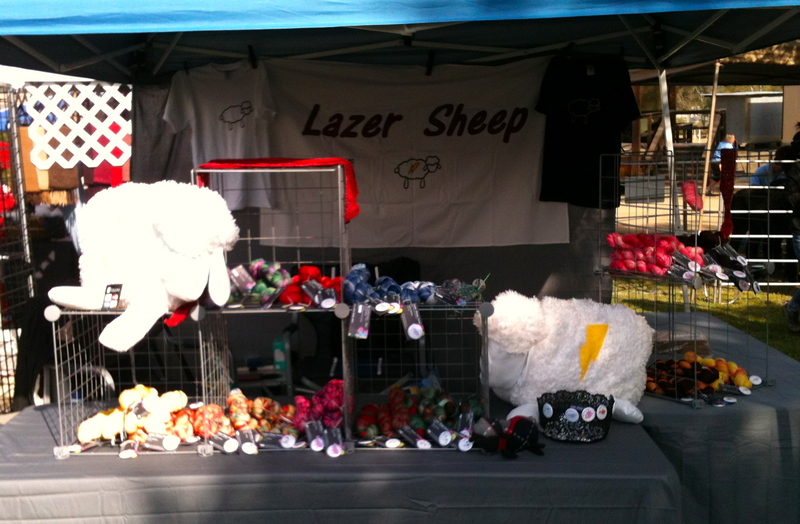 Those awesome stuffed Lazer Sheep are courtesy of my mom’s awesome sewing skills! Now, I’m having a little break, knitting on my Aloha Sheep hat (using my new knitting bag from Slipped Stitch Studios), and ordering more blank yarn so I can fill some custom orders. Hope you all had a nice weekend. What have you been working on? I was trying to explain the concept of stash busting to my husband this morning, while we were discussing the fact that I should be working on Christmas gifts by now. I was telling him that I needed a few, new, specific yarns for some of the projects. He said I should be using what I have, which is true. I have a lot. Trouble is, that it’s mostly acrylic from when I first started knitting again. This is were the fact that I am now a yarn snob really does me a disservice. I said to him that I would try and stash bust as much as I could this year. He joked, “Good, or I’ll have to stash bust you!” He then explained that by “stash bust” he meant that he had found my stash and was going to mess with it. This is my stash. It is not large, it is not organized. 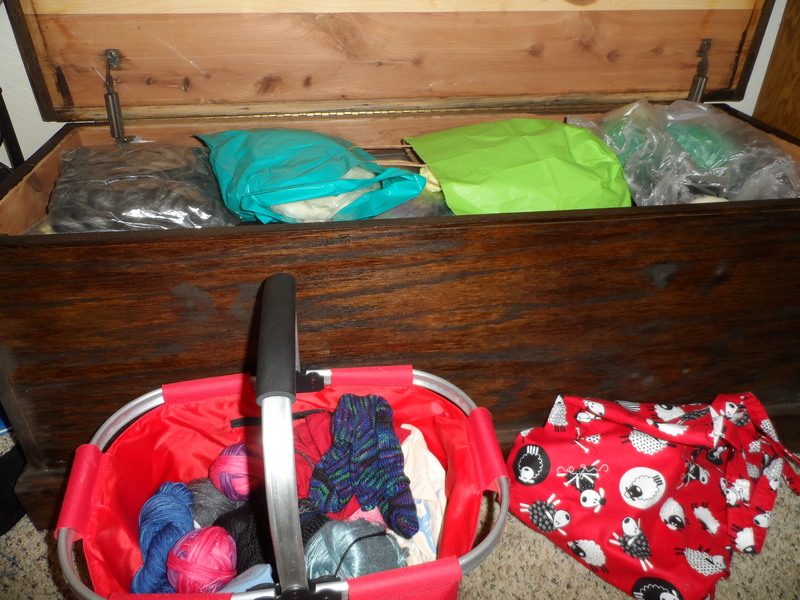 I’m trying to organise my knitting (and thoughts in general) for our upcoming road trip. I have my Sea Bands to hopefully ward off any potential motion sickness, and several patterns. 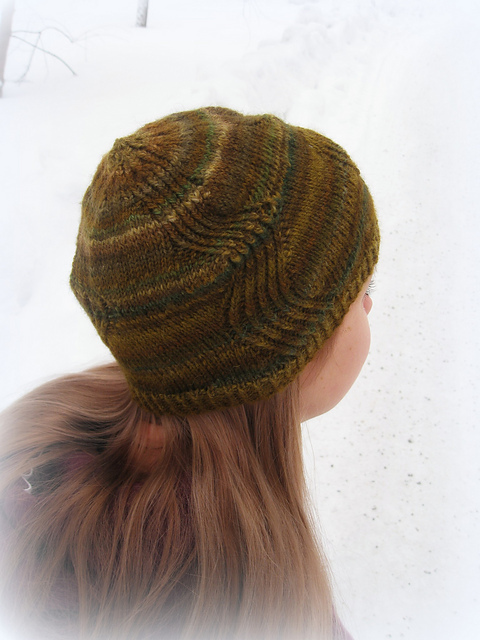 I’ve decided that hats would be something fairly easy to work on while in the car. 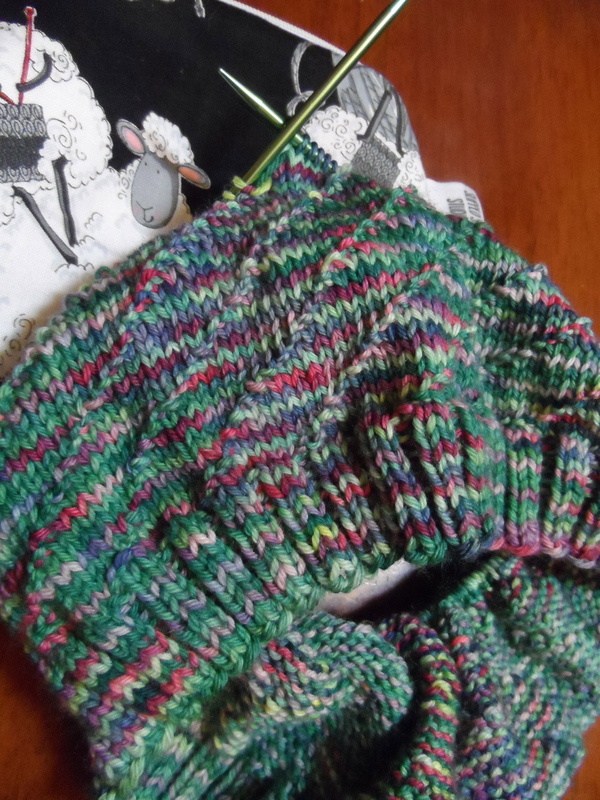 I also decided to knit said hats for Knots of Love (we don’t really go through a ton of hats around here). Per their required yarn list, I will be stash busting A TON of Carron Simply Soft that I came across while trying to organize all my craftiness. I may yet also pack up a pair of socks as I’m trying to teach myself to knit them two at a time with the magic loop. That sounds like a lot of knitting haha. 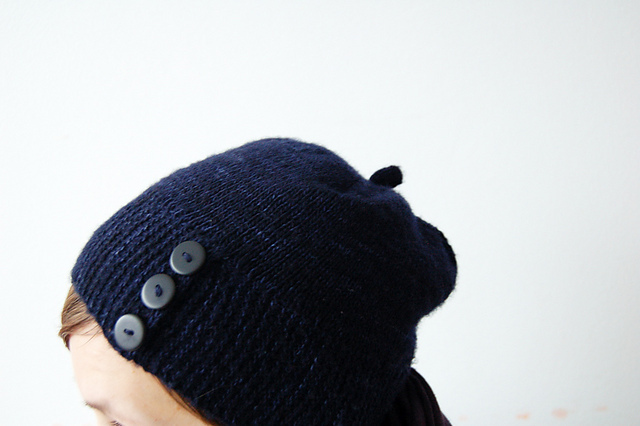 (…oooo maybe I’ll bring the spindle too…) What are your go to travel knitting patterns? Tonight was supposed to be so much easier than this! I had just gotten my new interchangeable circulars in the mail, but they are the wrong size!!! As you can see, I am attempting to cope with the cards I have been delt. Of corse, it is all my fault. I didn’t double check the size of the dpns I had been using when I ordered my new circulars. 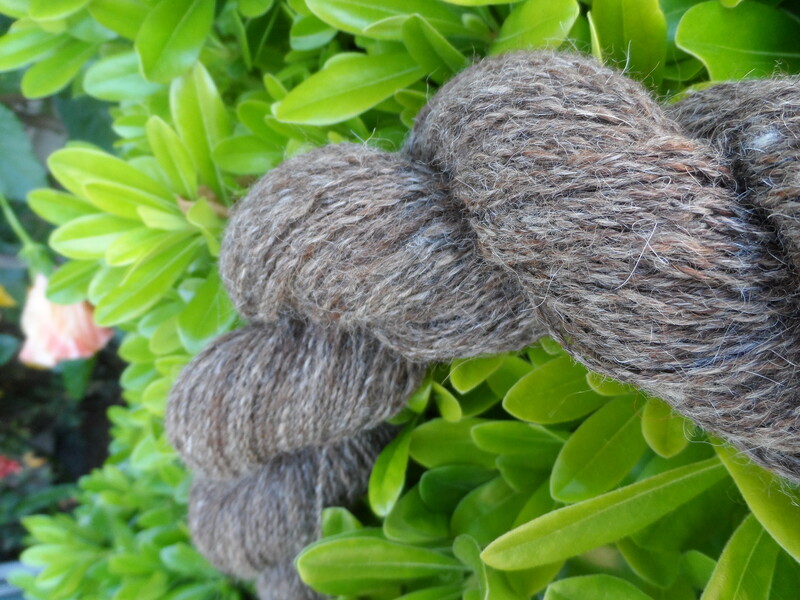 Now, I must keep plodding along on my hat (made of my new hand spun!!!) on dpns that can barley keep all the stitches on. 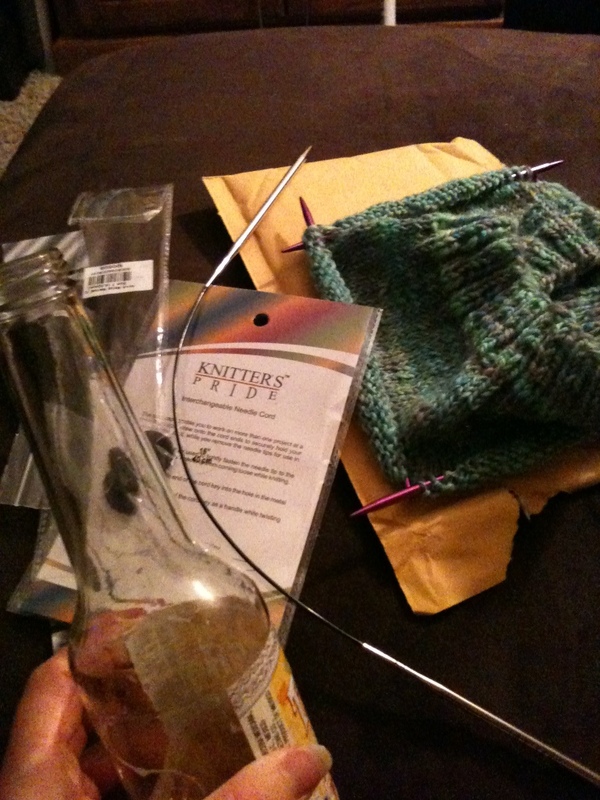 *sigh* Guess I’ll be finishing this hat before I head off on our road trip. What projects are keeping you up tonight? 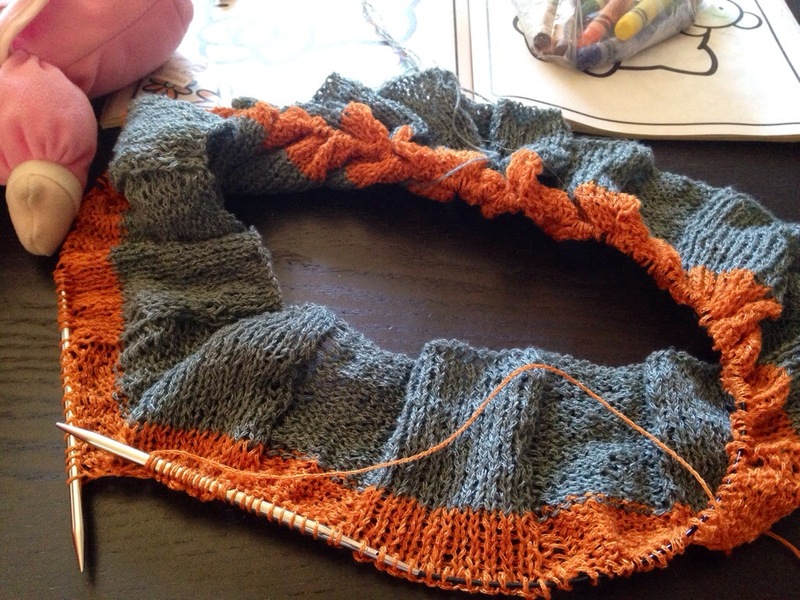 Former ribbed edge to your left, active stitches to your right! Since my hat had a ribbed edge on it, and I’d decided rather than frog the top half of my hat I’d add-on to the bottom brim. 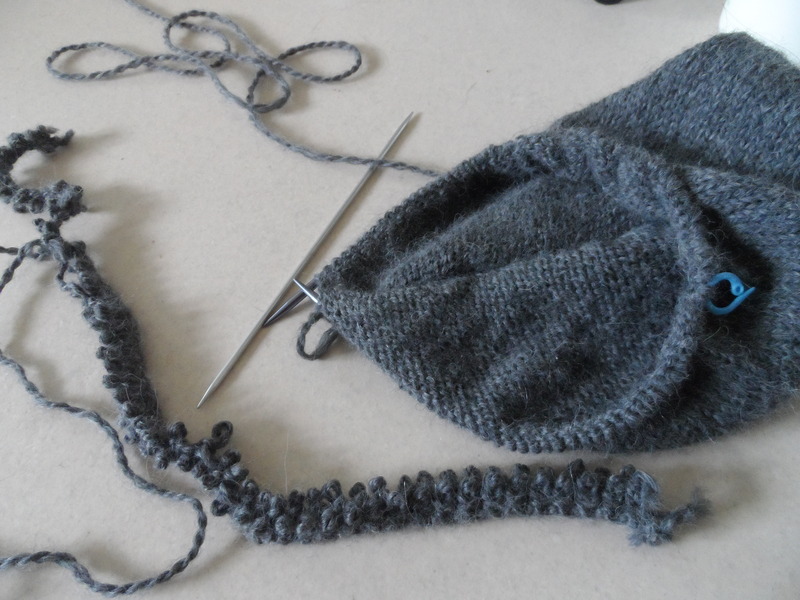 I picked a starting point and went around picking up one side to every V-shaped stitch. I picked up my stitches just above where I’d started the ribbing. It was much easier to see the individual stitches that I needed to pick up, and ultimately, easier to pick back the following row. 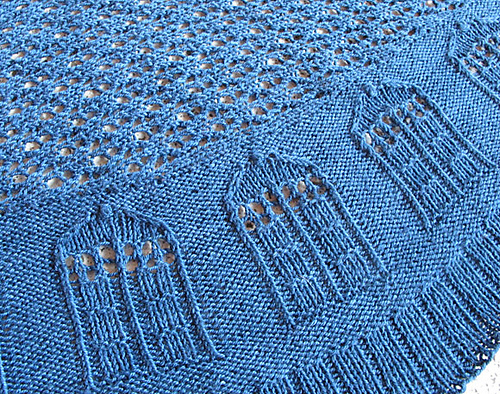 After getting all the stitches back on the needle, and checking that they were all in the same row, I snipped a stitch TWO rows above (assuming you’re holding the work upside down) the stitches I’d picked up. (Actually, I cut the very next row above and completely regretted it. So please, learn from my frustration.) I then painstakingly picked back the cut row, so that the stitches on the needle were active. This post from Knitting Daily shows this method in better detail. I had a pretty good tail of yarn still attached to the knitting, so I knit to the end of it and reattached the ball. I’ve measured (like 12 times) and am almost done with the reknitting. On top of that, I finished the “Baaad Sheep” shawlette today too! Pictures and a patter to come, yay!